As a result of the collapse, the water is draining out of the swamp and the peat is drying out. Vegetation and animals are dying including those that are endangered. The ability for the swamp to act as a water filter for the Wingecarribee Reservoir has been destroyed. The large volume of peat that was washed into the Reservoir impacted on water quality and necessitated the placement of a barrier to prevent it moving towards the dam. 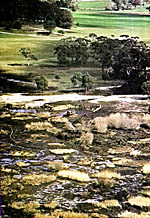 David Tranter, 'Case Study: Wingecarribee Swamp', Water: Wet or Dry? : The Proceedings of the Water and Wetlands Management Conference, November 1998, Nature Conservation council of NSW, August 1999, pp.90-97.